Pursuit Cribbage is a new invention, mixing together the best of cribbage with a pursuit element, allowing for a unique and exciting cribbage experience. 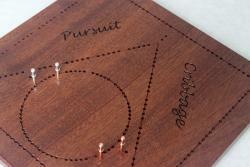 This one unique board allows 2, 3, 4 or even 5 players to experience the fun of pursuit cribbage. And it can also be used as a regular cribbage board for up to five players! It is made from mahogany and measures 12" x 12". It comes with fifteen metal pegs (3 each of 5 different metals) which live in a pocket in the back with a sliding brass plate. We also carry templates (digital and paper) and peg sets if you wih to make your own board.